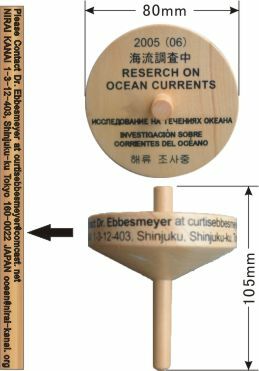 Beginning in June, 2005, one thousand wooden toy tops (koma) will be thrown into the strong ocean current known as Kuroshio, from the western shore of Yonaguni Island-the Southwestern Island in Japan. In total, ten-thousand toy tops will be released into the Kuroshio every two months over a period of 18 months. The objective of this research is to track which locations the toy tops have washed up onshore. In each release, the drifting buoy using the Inmarsat satellite will also be used to collect useful information on the toy tops' location, water temperature, etc. 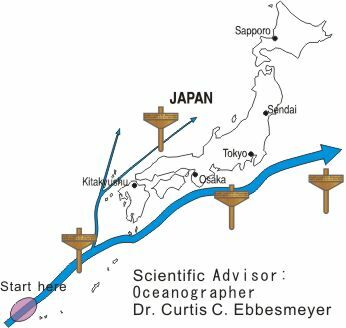 We will learn about the movements of the drifters into the Kuroshio and the seasonal and climatic changes of the ocean currents of the Kuroshio over time. As you see in the picture below, the Kuroshio (the Black Stream) is one of the biggest ocean currents in the Pacific. One part of the Kuroshio goes into the Sea of Japan and becomes the Tsushima Warm Current. Thus, many of the toy tops will probably be found on the coastal areas of Japan facing the Pacific, as well as the costal areas facing the Sea of Japan. Also, the ocean currents will carry the rest of the drifters to islands and other lands around the Pacific. Some researchers have noted that the first settlers in North America arrived by crossing over the land-bridge now known as the Bering Strait. A bridge of ice was believed to have connected the Bering Strait between Asia and North America during the last Ice Age. Jomon were found in Ecuador, which made some archaeologists think that some of them might have immigrated there. Researching the places of the stranded toy tops will possibly help us find some clues about ancient navigation. This experiment can be helpful in terms of ocean pollution as well. such as Japanese, English, Korean, Russian and Spanish. If you find a toy top (koma), please contact address below. 20060219　The fifth "Toy Tops" released on 13th February. 20051010-2 Drifting buoy "Momo" found on the beach of Niijima-Island. 20051010-1 The third “Toy Tops” and drifting buoy released on 5th October.